“Operative me” is a foreign exchange student, with the mission of executing “OPERATION HAVOC”. 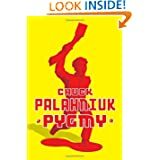 He is nicknamed Pygmy, because his American host family and peers view him as a small, dumb, poor little creature that just needs a little American culture and Christian faith. Those are the ingredients to prosperity and happiness, right? The host family is wonderfully dysfunctional, with a father who does top-secret government work, a mother who is always stealing batteries from her kids to power up and test drive the newest vibrators on the market. Then their 2 children, who routinely “Roofy” their parents in order to steal the family car, stay out late, or otherwise break the house rules. There was a violent scene early on in the book that almost made me return it, but if you can get past that, its pretty good. Written in a disjointed style, like nothing I’ve ever read before.